The DreamStation Heated Humidifier by Philips Respironics is the integrated humidifier designed to connect directly to the DreamStation Series Machines in order to provide optimum comfort by adding moisture to therapy air. This humidifier offers a standard fixed heating mode as well as an "Adaptive" mode which automatically adjusts heat and moisture levels. 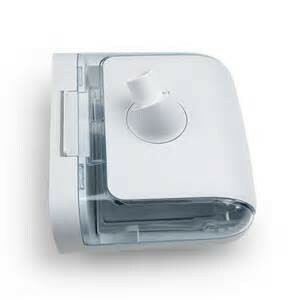 For increased warmth, add the OPTIONAL Heated Tube for DreamStation CPAP Machines. PR's DreamStation Heated Humidifier is a user-friendly humidifier built to correspond with the Respironics DreamStation machines. A heated tube may be added to therapy to maintain the warmth of the therapy air as it travels through the hose to the mask. Features •Adaptive Humidification Option •User-Friendly Chamber Design •Dry Box Technology •OPTIONAL Heated Tube •Compatible Hose Options Adaptive Humidification Option When paired with a DreamStation machine, the DreamStation Humidifier can be set in "Adaptive" mode, allowing the device to monitor ambient temperature and humidity levels in order to adjust the heating levels as needed. Adaptive humidification is intended to provide optimum moisture to therapy air while lowering the chances of condensation building in the hose. The humidifier can also be set to fixed humidification if the user wishes to maintain one heating level throughout the night. User-Friendly Chamber Design The DreamStation Humidifier features an easily accessible water chamber which is located in the center of the device. Release the lid by gently pushing forward on the tab located on the top of the humidifier. The panel will open completely, exposing the clear, water chamber. This 325mL chamber is easily lifted with both hands holding either side of the rectangular shape. Please Note: If filled with water, be cautious when removing the chamber to protect the humidifier from potential water damage. It is imperative not to fill the water above the maximum fill line. Dry Box Technology Dry Box Technology was created to help reduce the chance of water damage when the OPTIONAL humidifier is used with the DreamStation machine. In the instance that water may escape from the water chamber, the Dry Box is designed to trap the water within the walls of the unit to prevent water from traveling through the machine and humidifier connection. Additionally, the air outlet port uses a one way valve to prevent water from exiting the water chamber and entering the machine. The air outlet port is located on the top of the chamber to help minimize total water displacement. OPTIONAL Heated Tube Adding the OPTIONAL heated tube to CPAP therapy may decrease the chances of rainout while providing warmth in the therapy air. As warm air is moves from the humidifier to the machine, the heated tube maintains an elevated temperature to ensure heated air is delivered to the user. When the warm air is pulled into the hose, the temperature of the hose works to prevent environmental temperatures from cooling the warm air inside the tube. Compatible Hose Options Respironics' DreamStation Heated Humidifier is compatible with three hose types. The user may select between a standard 22mm hose, a slim 15mm hose, or the OPTIONAL DreamStation slim 15mm heated hose. The variety of hose options allows for a combination based on individual preferences. Please Note: The DreamStation Heated Humidifier is only compatible with Philips Respironics DreamStation Series machines.